There are numerous causes of dandruff. The condition is likewise associated with various skin and health issues. 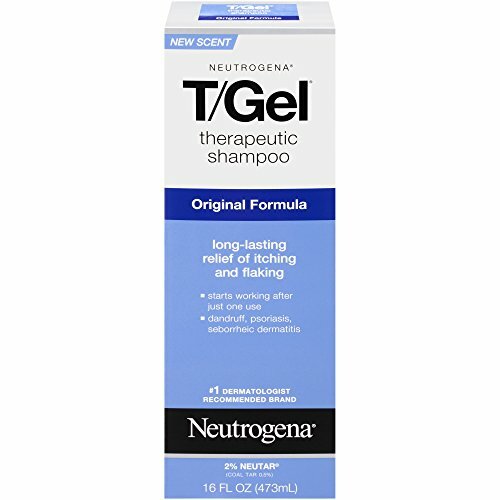 If you want an anti-dandruff shampoo that can deal with different scalp problems, Neutrogena T/Gel Therapeutic Shampoo may be a good product for you. It comes with coal tar. One pack contains 16-ounces of fluid. It deals with dandruff, seborrheic dermatitis, and psoriasis. It is formulated to have long-lasting effects. It can work as a complete scalp therapy. It uses a rich, amber formula that can relieve itching and flaking and thoroughly cleanse the scalp. It has the capacity to fight various problems. It can treat dandruff and help eliminate other scalp issues; hence the complete scalp therapy. It is scientifically proven to be an effective anti-dandruff product. It can work long hours after rinse, thus, providing convenience and protection to its users. It comes with coal tar, an FDA-approved ingredient. It cleanses the scalp thoroughly. It is strong enough to fight off scalp issues but is gentle enough to be used daily. It works well even with severe cases. It works fast to the point that it can even provide instant results. Its odor is not that pleasant. It may burn the scalp or skin when exposed to sunlight. It has a tendency to make hair dry. It may have a minor tendency to cause discoloration of bleached gray, blonde, or tinted hair. At present, Neutrogena has already established its name in making great beauty products. It has proven its high-quality work in improving one’s skin and hair. No wonder it works great as a dandruff shampoo as well. The effectiveness of Neutrogena is scientifically proven, making it more appealing to numerous customers. The product has an exceptional strength in fighting various problems, but it is gentle on the scalp. You can rely on it whether you are suffering from moderate or severe dandruff. Take note, however, that its odor is not that pleasant. It may also burn the scalp when exposed to sunlight. These downsides are outnumbered and outweighed by the upsides. You can also deal with them easily and even avoid some of them if you carefully follow the directions for use. After learning about the qualities of Neutrogena T/Gel Therapeutic Shampoo, do you think it is worth trying? Probably yes. First off, being a popular brand is an undeniable advantage for the product. And beyond being popular, it has established a good reputation among its customers over the years. Moreover, it provides exceptional benefits that users can definitely enjoy. It may have some disadvantages, but they are just minor problems that you can solve. Should you need to learn more about the product, don’t hesitate to do further research. Also, be certain about your condition and your personal preferences to make sure you’re making the right pick. Apply tea tree oil to soothe your scalp. Do you know that tea tree oil has fungicidal properties? Extract the oil from the leaves of a tea tree then apply it on your scalp to relieve soreness and itchiness. It is also effective for insect bites, cuts and burns. Be sure to use it only for topical treatment and not for ingestion. Restore your skin cells with aloe vera. Prolific cell growth and dead skin cells cause dandruff. Aloe vera prevents the rapid growth of skin cells. It also helps bring back the cells into their normal or physiological condition. Rinse your hair with vinegar. Dandruff occurs due to dead skin cells that dry and build up. To get rid of these itchy flakes, pour vinegar on your scalp. It works like a fungicide, so it also addresses the problem of fungal growth. Rub it off with salt. With its abrasive crystals, salt can effectively exfoliate dead skin scales and get rid of excessive oil on your scalp. With a clean scalp, your shampoo can perform to its maximum potential. Loosen the flakes with baking soda. The ever-reliable baking soda can help you eradicate those itchy flakes. Just rub a substantial amount of baking soda on your scalp to gently exfoliate the dead skin cells. Then brush your hair to shake off the broken flakes. In the process, it also helps eliminate the fungus that causes dandruff.